Japan’s geisha are famous the world over, but as they usually perform only at small private gatherings in the teahouses of the geisha districts, it’s not often that visitors from overseas get to see them. Even having deep enough pockets to pay for a private geisha party isn’t good enough – you need an introduction from an existing client in order to gain admittance to the private and exclusive world of the geisha. Fortunately, Kyoto’s geisha communities put on annual public shows, which provide an opportunity for less-privileged ordinary people to see the geisha perform their arts. The most famous of these performances is the Miyako Odori, at which the geisha of the Gion Kobu geisha community perform. Geiko are women trained in dance and music, with an emphasis on grace, beauty and dignity. 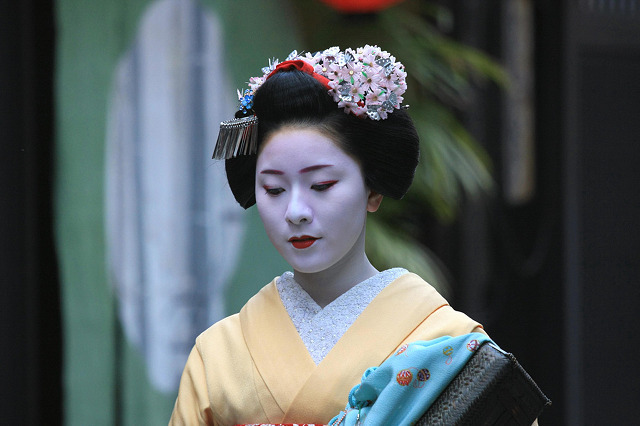 (Kyoto geisha prefer to be called ‘geiko’ meaning ‘arts child’, rather than ‘geisha’, which means ‘arts person’.) Geiko communities are very traditional, and are governed by strict rules, and the Gion Kobu community is perhaps the most conservative of all. Geiko begin their careers as apprentices called ‘maiko’, usually aged fifteen. From then on, they move into a geiko house, and dedicate their lives to the geiko world. First they are trained in conduct becoming of a geiko – bowing deeply to show respect to their seniors, and undertaking everyday tasks with grace and elegance. They then move on to training in the geiko’s arts, such as music, dance and calligraphy, and they begin to join the geiko in entertaining clients in Kyoto’s teahouses. Around the age of twenty, maiko graduate from their apprenticeship, and become fully-fledged geiko. Maiko dancing on a walkway at the right side of the theatre, in front of an orchestra of shamisen players. All the performers, including the musicians and singers as well as the dancers, are women. ‘Miyako’ means capital city, and ‘Odori’ means dance, so ‘Miyako Odori’ translates literally as ‘Capital City Dances’, which makes sense when you consider that Kyoto used to be the capital of Japan, and that ‘Kyoto’ is still written with characters meaning ‘capital city’. In English the dances are often referred to as ‘The Cherry Blossom Dances’, because they take place in April when the cherry blossoms are in bloom, or sometimes just as ‘The Kyoto Dances’. Despite the name, the dances began in 1872, four years after Tokyo took over as the capital of Japan. That was the first time that Gion Kobu’s nationally-famous geiko performed in public. Since the second season in 1873, the dances have been held at the Gion Kobu Kaburenjo Theatre, and they continue to be popular with both Kyoto locals and visitors to the city. There are four hour-long performances each day, at 12:30pm, 2pm, 3:30pm and 4:50pm. This schedule is maintained every day throughout the whole of April – making the dances extremely hard work for the geiko and maiko – especially as they are expected to produce a flawless performance every time. Each performance has about eight scenes, each of which depicts some aspect of Japanese life, especially life in Kyoto and the geiko districts. There is a particular focus on traditional places such as shrines and temples, and on the changes seen in nature throughout the year. The performances aren’t restricted only to dance – the geiko also sing and act out mini-dramas. A huge amount of work goes into producing lavish costumes, and the geiko and maiko are elaborately made-up with white-painted faces and ornate hairstyles. Throughout the performance, around 60 geiko and maiko take to the stage, each wearing exquisite kimono decorated according to the theme of their act. They are accompanied by an orchestra playing traditional Japanese instruments. At the end of the show, all the performers return to the stage for a magnificent finale. 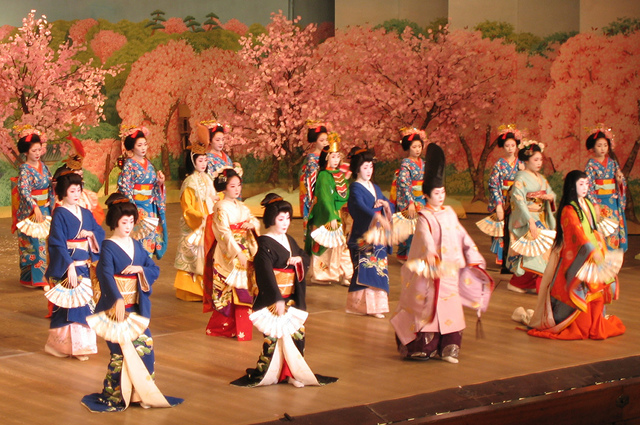 The finale of the dances, in which the geiko from all the different scenes return to the stage. You have an option of either a first or a second class ticket, costing either ¥4,000 or ¥2,000. First-class ticket holders are assigned seats on one of the first two levels, or space on a tatami mat in the wings. Second-class ticket holders get to sit on tatami mats on the third level. Tickets generally sell out quickly, but a few second-class tickets are reserved for sale on the day of the performance – so if you’re prepared to get up early and stand in line, you’ll be able to get in even if you haven’t booked in advance. The theatre is not particularly big, so wherever you sit, you won’t be too far from the performers, resulting in a good viewing experience for everyone. For ¥500 on top of the price of a first-class ticket, you can buy a ‘special ticket’ that gives you access to some extras. Firstly, you get to explore the theatre’s Japanese garden before the show, and admire a small exhibition of kimono. It’s well worth taking a good look at the kimono, as it’s a rare chance to see the intricate embroidery of formal kimono close-up, and the kimono worn by Gion Kobu’s geiko are some of the most elaborate (and expensive) ever made. 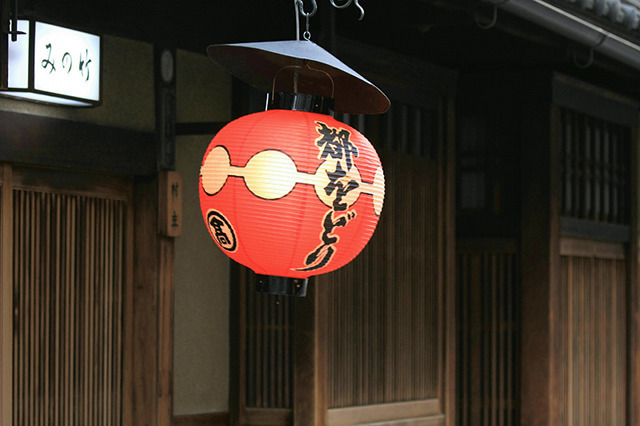 Each is a unique work of art, skilfully hand-made, often by designers and craftspeople based elsewhere in Kyoto. After this, you get to enjoy the main benefit of the special tickets: taking part in a tea ceremony. 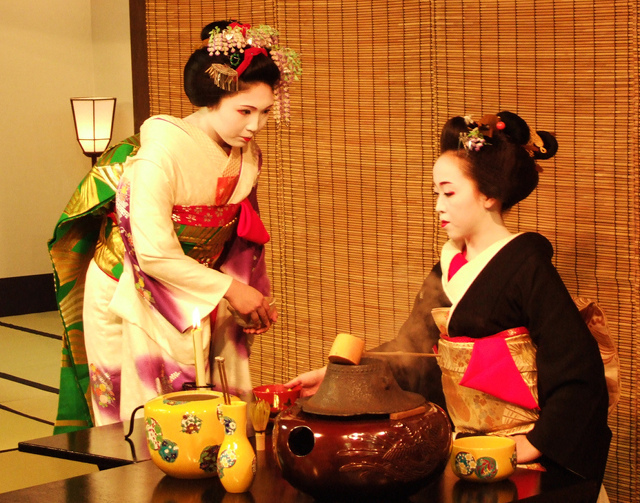 A geiko sits on a platform at the front of the room and prepares powdered green tea, assisted by a maiko. Every motion is carefully controlled so that the whole process is performed with grace – geiko spend long-hours practicing so that they can make tea according to a strictly defined procedure that aims to make the whole process as aesthetically pleasing as possible. One lucky person is then given the tea prepared by the geiko, while everyone else is served with tea brought in by kimono-clad attendants. You also get a manju – a sweet containing red bean paste, which is served on a hand-painted ceramic dish that you get to keep as a souvenir. You won’t have long to drink up before it’s time to move on to the main auditorium ready for the performance to begin, but it’s well worth paying a little extra just to get this additional glimpse into the geiko world. You can book by phone or fax (see the official website for details), but credit cards are not accepted, so in practice most visitors find it easier to book through the hotel where they are staying. The theatre is about ten or fifteen minutes walk from Gion-Shijo Station on the Keihan Line, or Kawaramachi Station on the Hankyu Kyoto Line, and there are many local bus services. If you’re not able to make it to Kyoto in April, or you just want to see something slightly different, similar performances are held by Kyoto’s other geiko communities, each of which has its own unique style. The Pontocho geiko community has also been putting on annual public performances since 1872. 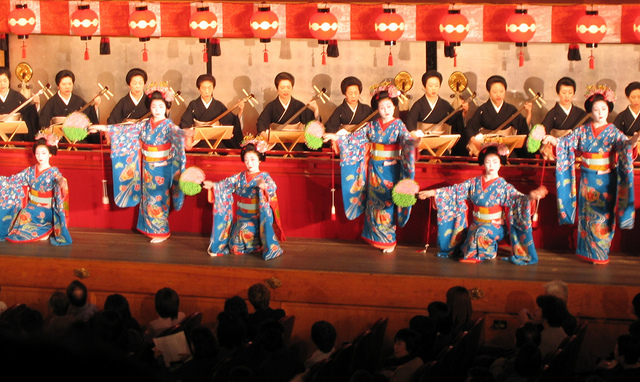 Their performances, the Kamogawa Odori, or Kamo River Dances, are held in May at the Pontocho Kaburenjo theatre. They are famous for the extensive use of hand fans in their dances. In November, the Gion Higashi community, which is known for the originality of its choreography, puts on the Gion Odori at the Gion Kaikan theatre. Finally, two other geiko communities put on their dances in parallel with the Miyako Odori. The Miyagawacho community perform the Kyo Odori dances in the first two weeks of April at the Miyagawacho Kaburenjo theatre, and the Kamishichiken community perform the Kitano Odori dances at the Kamishichiken Kaburenjo Theater towards the end of April. Another option is to go to Gion Corner, where you can see a display of seven of Kyoto’s traditional performing arts, including tea ceremony and a dance by two maiko. This will give you just a tiny taste of what you would see at one of the annual dances, but it’s the best option for seeing geiko perform other than at the annual shows. Performances are at 6pm and 7pm every day, and cost ¥3,150 (or ¥2,200 if you’re aged under 23), but if you print out this coupon before you go, you can get in for ¥2,800. Gion Corner is in the Yasaka Hall, right next to the Gion Kobu Kaburenjo Theatre where the Miyako Odori are held. This video shows the maiko Mamotomi (in green) and Mameyuri (in black), both from Gion Kobu, performing at Gion Corner. Whichever of the dances you end up attending, be sure to appreciate that you are seeing a unique art form that has been developed over many generations. The number of geiko all over Japan is in decline, as fewer and fewer girls are willing to tolerate the constraints inherent in the geiko world, or to give over their youth to the long days of hard work and endless practice that are needed to achieve proficiency in the arts of the geiko. Soon there might not be enough fully-trained dancers and musicians to enable the geiko communities to put on these elaborate performances, so you might be one of the last people ever to see a geiko performance on this scale. If you’re interested in finding out more about Kyoto’s geiko, check out our books page.